The SQL Else If statement is very useful to check multiple conditions at once. It is an extension to the If then Else (which we discussed in the earlier post). 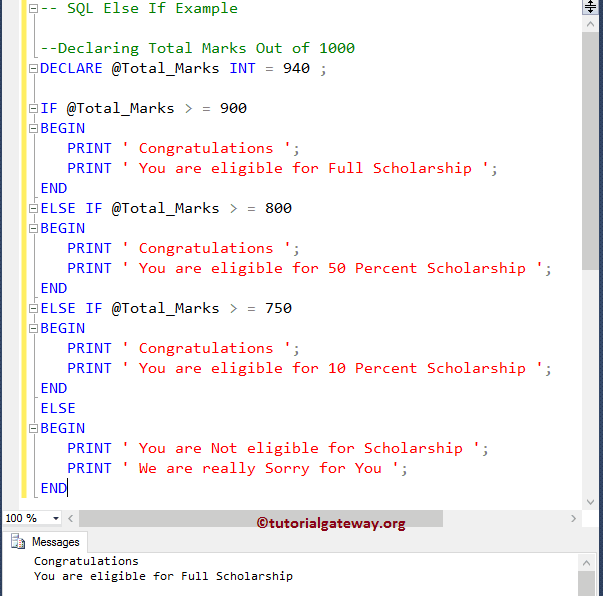 The SQL Server else if statement handle multiple statements effectively by executing them sequentially. It will check for the first condition, if the condition is TRUE then it will execute the statements present in that block. If the condition is FALSE then it will check the Next one (Else If condition) and so on and so forth. In these situations, statements under the Condition 1 will be executed because ELSE IF conditions will only be executed if it’s previous IF or ELSE IF statement fails. 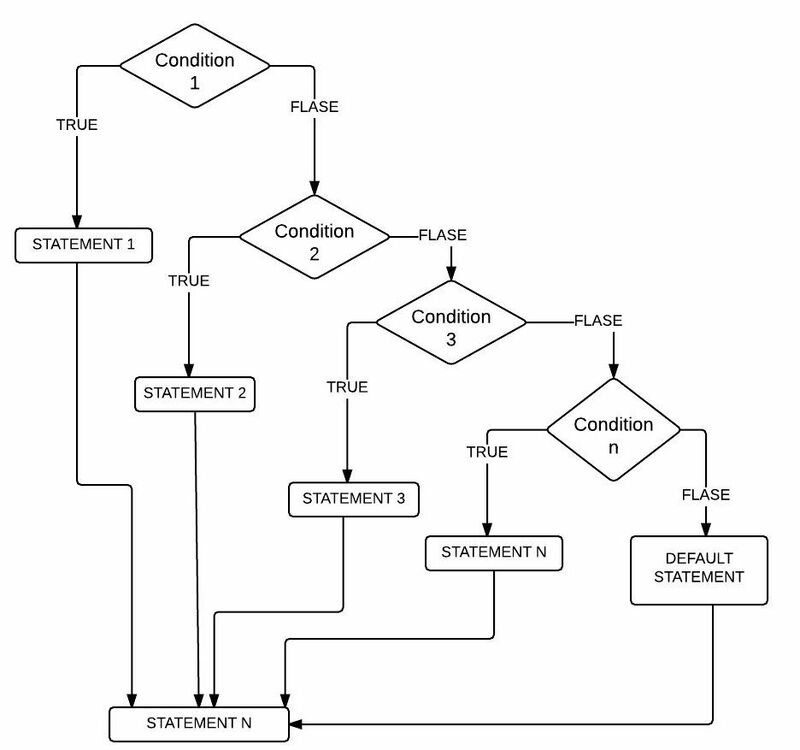 Let us see the flow chart of the SQL server else if statement for better understanding. 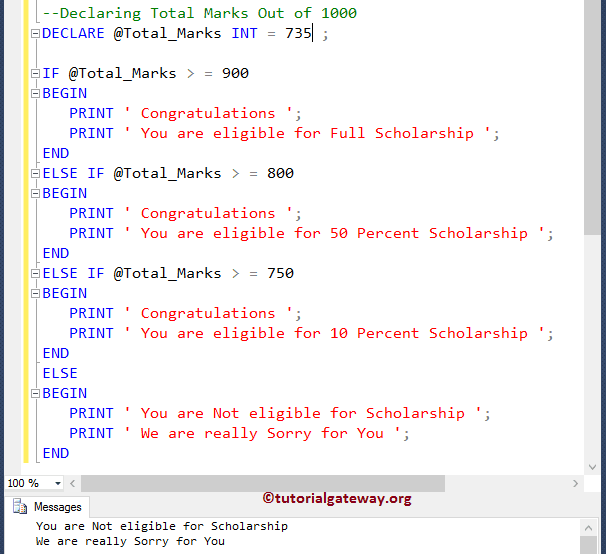 OUTPUT 2: Let us change the Total_Marks from 940 to 820 to show the SQL else if statement example. 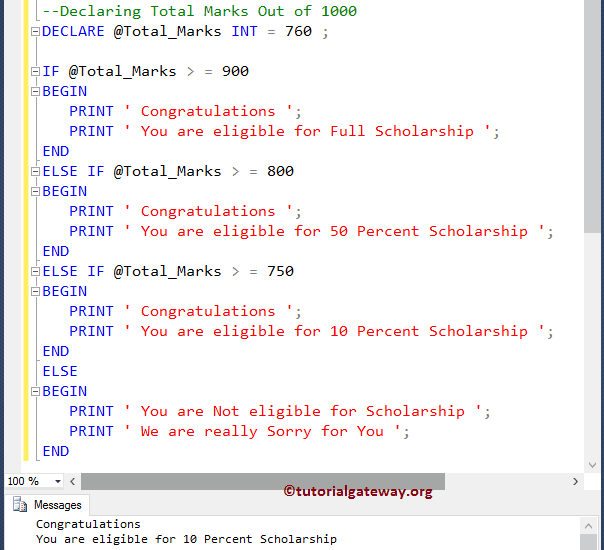 Here, first IF condition Fails so, It will check the else if (@Total_Marks >= 800), which is TRUE. So it will display the statements within this block. Although else if (@Total_Marks >= 750) condition is TRUE, but it won’t check that condition. OUTPUT 3: Let us change the Total_Marks from 820 to 760, which means first IF condition and Else if (@Total_Marks >= 800) fails. 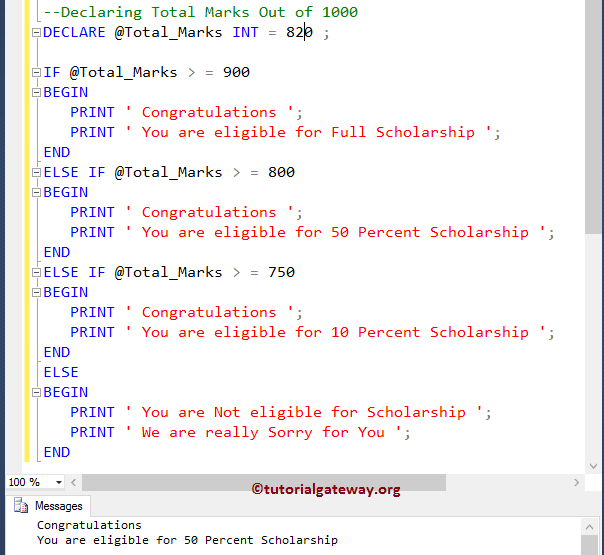 So, It will check the else if (@Total_Marks >= 750), which is TRUE so it will print the statements inside this block. OUTPUT 4: We are going to change the Total_Marks to 735. It means all the IF and Else If conditions Fail. So, It will print statements inside the else block.